Duha Sahaf (R), mother of two, and her sister Sece Yunus (L) are studying at Siirt University. The dreams of many young Syrians who fled the brutal civil war in Syria and sought refuge in Turkey have come true. After successfully passing their high school exams in Turkey, Syrian youth now have the chance of going to university. Turkey gives extra importance to the education of Syrian children and young people. At the same time it ensures the basic needs for shelter, nutrition and health of Syrian refugees, who took refuge in Turkey after fleeing the civil war and oppression of the terrorist organizations - the People's Protection Units (YPG)/PKK and Daesh. Across the country, more than 600,000 war-weary Syrian children receive an education in their own language and syllabus. All means available are used for these young people to prevent them from remaining behind in their education; so they can dream of picking up the pieces in their own country and having a good job in the future. A large number of guest students who live at and attend high school at the Harran Temporary Refuge Center in Şanlurfa, one of the cities with a dense Syrian population, experience the joy of continuing their education in different departments of different universities in Turkey. Duha Sahaf, 22, who took shelter in Şanlurfa from Deir el-Zour nearly seven years ago, told Anadolu Agency that she had to escape from her country during her high school education because of the war. Sahaf stressed that she and her sister won the First and Immediate Aid Department of Vocational Health Services School at Siirt University, "It became nearly impossible to live in Deir el-Zour. We came to Turkey together with my family at the age of 15. We are in Turkey for nearly seven years. I received an education in Syria until the grade 10. After I came here, I graduated from high school. Then, I learned Turkish and took the university exam. I got a place in the First and Immediate Aid Department. I am married and have two children now. I am a senior student. I leave my 2-year-old daughter with my mother and my younger daughter is with me. It is hard to be a mom and also continue to go to school. I go to my school for my family. It is a nice feeling. We escaped from the war and were worried about our lives. School was not even in our dreams. However, Turkey offered us all kinds of opportunities. We never felt that we are away from home. My friends and I continued our education, just like our Turkish peers. I cannot offer enough thanks to Turkey and god." Noting that she learned Turkish even though it was hard, but many things got easier for her in life, Sahaf said, "We want to return to our country after our education if the war ends." Salih Halebi is currently studying at the Medical Faculty of Selçuk University. Muhammed Halebi, 20, who won the Faculty of Medicine at Malatya University said that they came from Hama nearly six years ago. Halebi dreamed of becoming a doctor since childhood. He said, "I had finished secondary school in Syria, but I could not go to high school because of the war. I remember those days that we suffered a lot. We took shelter here in order to save our lives. After we came here, they took us to this container city. This became our home. I picked cotton in autumn and tried to spend money only for school. I studied at a high school here and took a language exam. I was successful. In this way, I stepped into my dream profession, becoming a medical doctor. I enrolled in the Faculty of Medicine at Malatya University. I am preparing this year. As of next year, I will start lessons. Being a medical doctor is a sacred profession. My brother also studies at Selçuk University Faculty of Medicine. God bless Turkey, which enabled us with this opportunity. I hope to become a successful doctor, finishing my education. I hope we can go back home after the war." 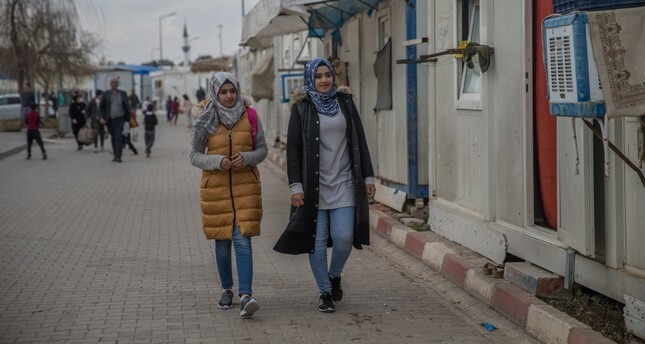 Sece Yunus, 21, who came from Deir el-Zour, said that they have been living in a container city for nearly seven years and said that she misses this place when she goes to the university. Explaining that she is very happy to have achieved her university dream, Yunus said, "We have been in this container city for a long time. I went to high school here. Then, I prepared for a year. I got into the First and Immediate Aid Department of Vocational Health Services School at Siirt University together with my elder sister. I am a sophomore now. I hope after finishing school I perform well in my profession in the health sector, which I love." Yunus said that she was sad to have had to leave school when they first came to Turkey and stressed, "However, this fear left and in its place hope came with opportunities provided by Turkey and my own efforts. I am so happy to be able to continue my education in the department that I want." Abraham Umar said that he lost his father during the conflict in Syria and came to Turkey with his family after facing a very difficult period. Umar finished his high school education at the container city. "Thank god, I got into the Department of Nursing at Siirt University. My dream was having a job in the health sector since childhood. I am so excited to be closer to it," he added.